Written by Carly McLeod I had an opportunity to sit down with Salar from MeatVentures to talk about their up-coming plans for the summer as they hit the streets of Hamilton with their Meat Wagon! I was also fortunate enough to try their smokey-Sriracha bacon which is fantastic. 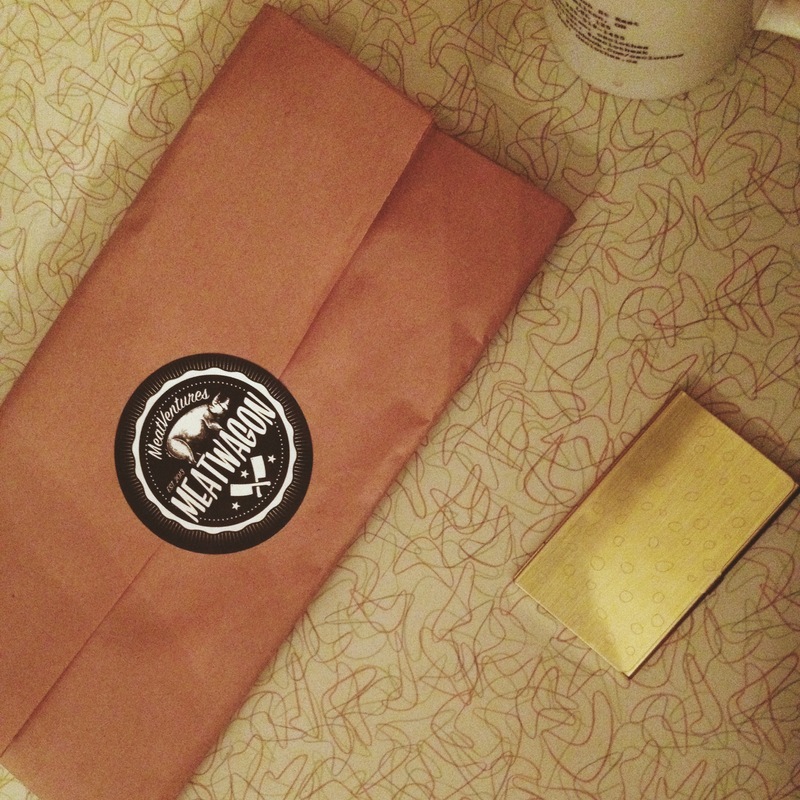 If you love yourself some unique carnivorous treats, MeatVentures will not disappoint. This is not your average food cart – no hot dog in sight! 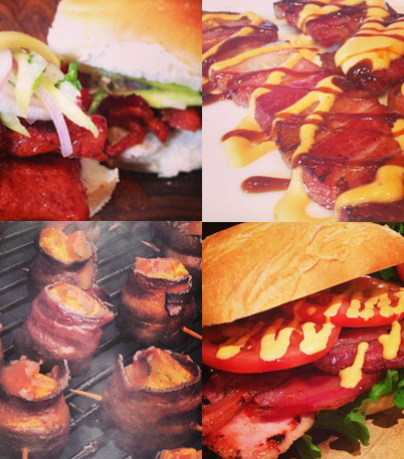 Watch for MeatVentures Meat Wagon at your local events – trust me, you are going to want to try it out. FGFS: What do you have planned for this summer? MV: It has been a busy time for us gearing up for the warming weather. We are starting a food cart, vending on weekends at local events! Look for Persian tacos, Filipino sliders, thick cut house made bacon on a stick, and a BLT with 3 kinds of house made bacon… plus more. 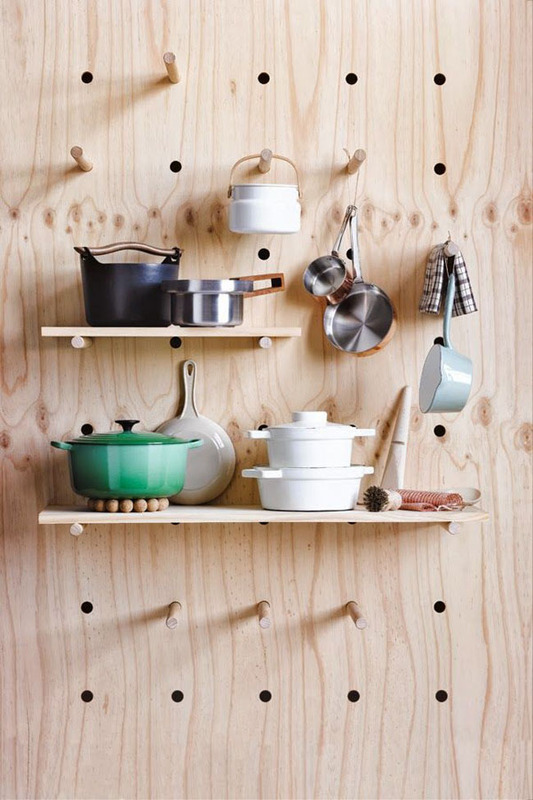 We’re aiming to do everything in house and fresh. We are working with Roux Commissary to get our Meat Wagon on the streets. Roux Commissary is doing a cool program, we are going to the first do be doing this kind of thing. It’s a new thing for everyone. Within this community we are constantly learning we helping each other. With Roux’s guidance, we are able to find venues to go to and vend. We are also a BBQ Competition Team! We started this last year and were quite successful. We enter in 6 competitions and won 3 of them. We came in 2nd in 2 of the competitions. It turned out really well! FGFS: What inspires your dishes? FGFS: What made you think about bringing your love of food to Hamilton? MV: My wife, Jeannie and I lived in Downtown Toronto, we planned to move, and moved to Hamilton. We were looking at getting a bigger place in Toronto, but my wife and I both wanted to branch out more. We decided on Hamilton. It gives us the opportunity to work on MeatVentures. There is a great community here – especially working with Roux, they have a licenced kitchen the equipment, and resources to help us get started. Really they are a food incubator and it is wonderful go through this experience with them. FGFS: Favourite place to eat in Hamilton? MV: Memphis Grill in Winona – excellent tasting, large portions! I was able to catch Meat Ventures in action at the Home and Garden show in Hamilton on March 2nd. They participated in a grilling competition put on by Chadwicks and Hacks. Despite BBQ competition happening in subzero temperatures, Meat Ventures came out on top in the freestyle portion of the competition where teams had to prepare an appetizer, a main course, and dessert. It was awesome to see such passion for food and dedication to creating unique dishes. The cooler temperatures outside meant paying close attention to the temperature and timing, as most competitions take place in the summer! Congrats Salar and Jeannie – you guys rocked it! 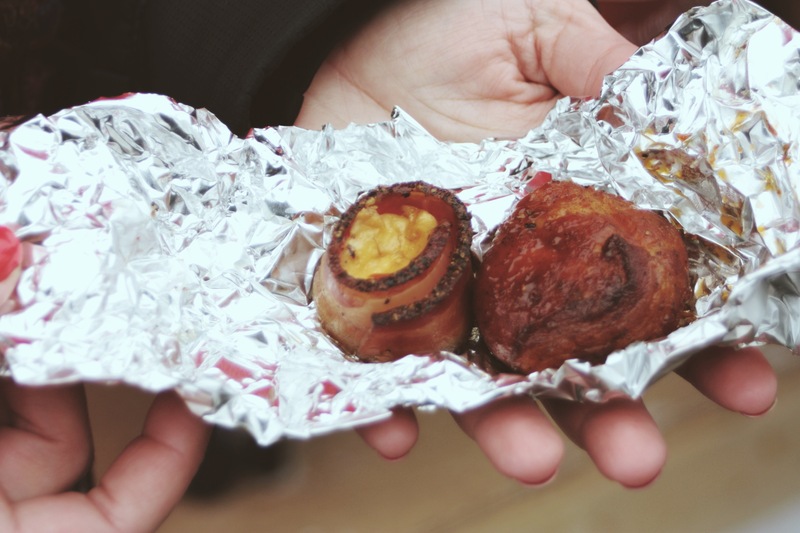 Bonus points (from me) go to Pig Shot snack – “sausage and black pepper bacon shooter, filled with a mix of Dawson’s Jalapeno Garlic sauce, cheese mix, and brown sugar for a bit of sweetness”. You do not want to wait until the sunshine of summer to get a taste of MeatVentures. Stop by the Roux Commissary Booth at the Food and Drink Festival in Hamilton on March 22, 2014 from 12:00-5:00pm to see MeatVentures. 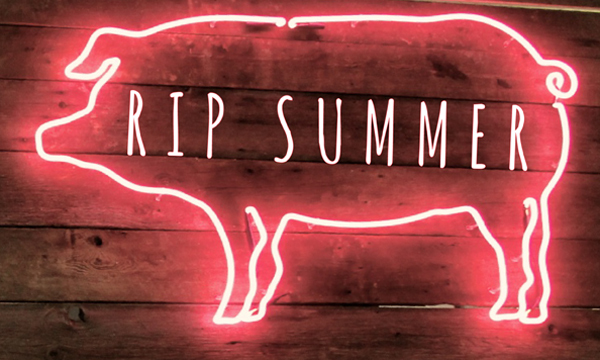 And, to get yourself a Pig Shot – you will not regret it. 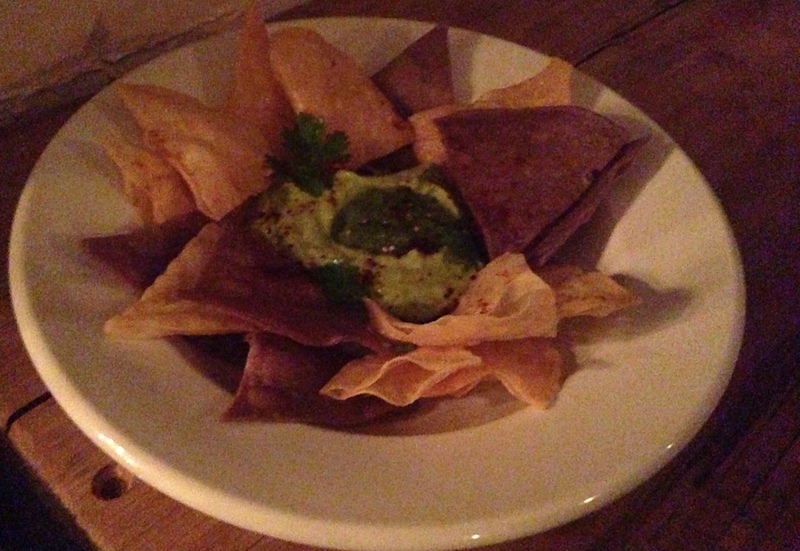 What can I say about the newest restaurant opening on Queen West, Fonda Lola? Well for starters: this is quite a bit of history packed into that resto. First things first, as I walked through the door that cold November evening, I was greeted by energetic and kind, Andres Marquez who was slinging drinks behind the bar who handed me a margarita (more on those later). From the kitchen walked out Ernesto Rodriguez and Howard Dubrowsky, the two other owners (with Andres). For foodies with knowledge, Howard use to be the former chef and owner of L.A.B. on College. But after coming together as partners and creating the ultimate in Mexican Fiesta, they settled upon the old Lafayette Bistro location (942 Queen West) and Fonda Lola was born. Many renovations and menu preparation was done in advance of this day and night, where several of their friends were invited into the space to join them in celebrating. So let’s get back to that Margarita, shall we? 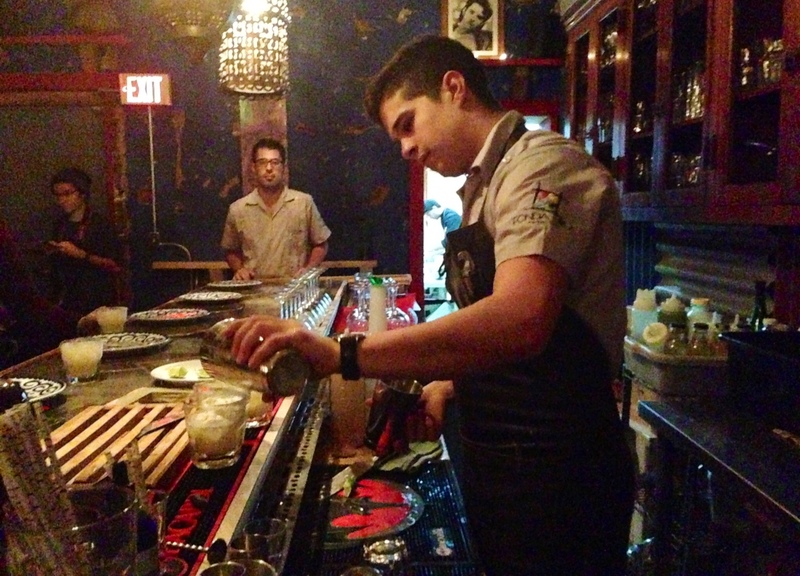 Fonda Lola makes several tequila-based drinks using (wait for it) kombucha, which is a fermented black tea. At first, I was somewhat skeptical on how this would taste. But let me be the first to report back: it’s good. Like, really really good. Andres has a way at making you feel at ease, letting me try an original kombucha margarita and then a cherry kombucha margarita. All their margaritas come in at the price of $10.50 each. You have the ability to order other drinks such as beer and wine. All of the food takes a very traditional approach with recipes straight from Mexico, we are told. The menu is divided up into three different parts: Frio (which consists of appetizers and snacks, $5-8), Caliente (main dishes, ranging from $5-14) and everyone’s favourite dessert. The other appealing thing about Fonda Lola? You can buy out the entire menu for $100 which they have aptly titled the “Mexican Fiesta”. For starters, we were brought out their Guacamole & Chips ($5) and Trout Aguachile ($8). All of the dishes were paired with chips (made in-house) and the guacamole had an extra little kick to it, which caught you just at the end. It was nice and refreshing. 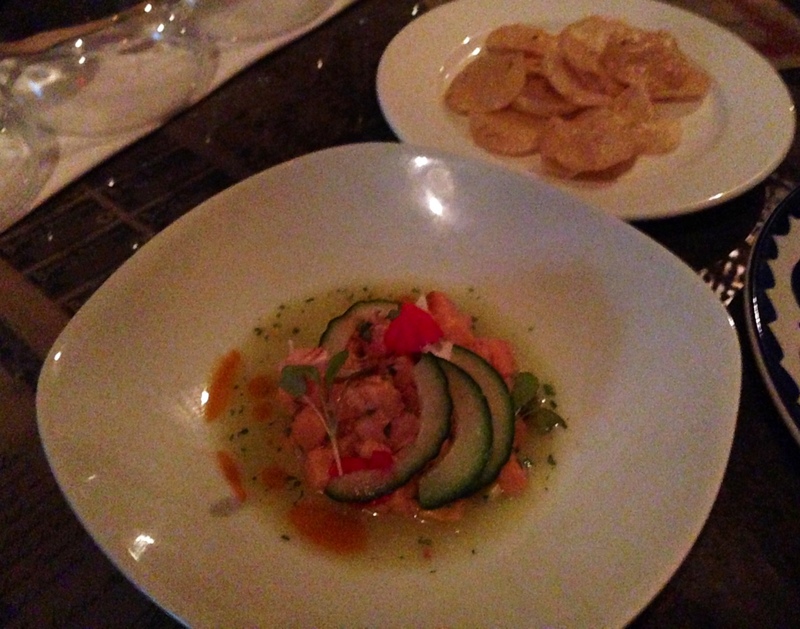 The balance of the Trout Aguachile (very similar to a ceviche dish) was perfect with lots of lime flavours. Nothing overpowered the fresh taste of the trout here, which was excellent. 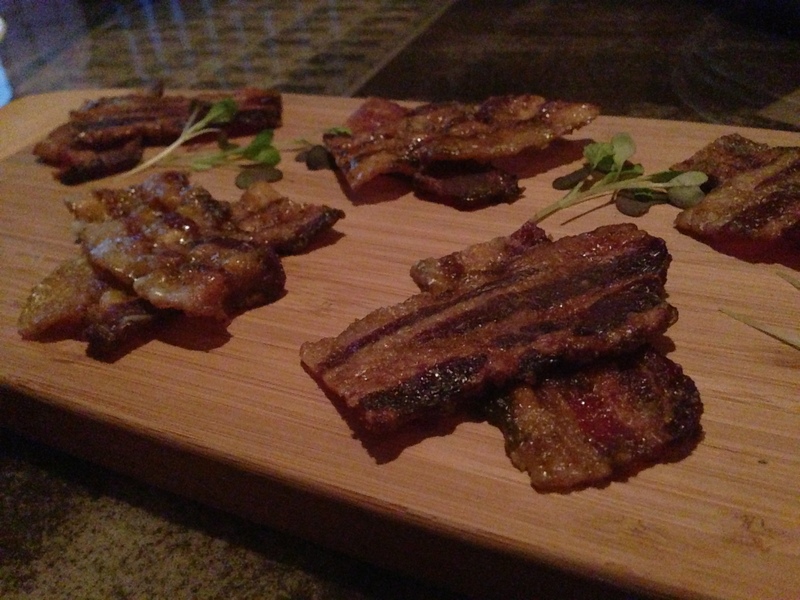 Next up, we were treated to their thick-cut Candied Bacon ($5), which had some chill flavouring. Just the right sweet and heat, which makes it good for either a snack or a dessert, in my humble opinion. I mean, you can’t go wrong with bacon and this did just the trick. 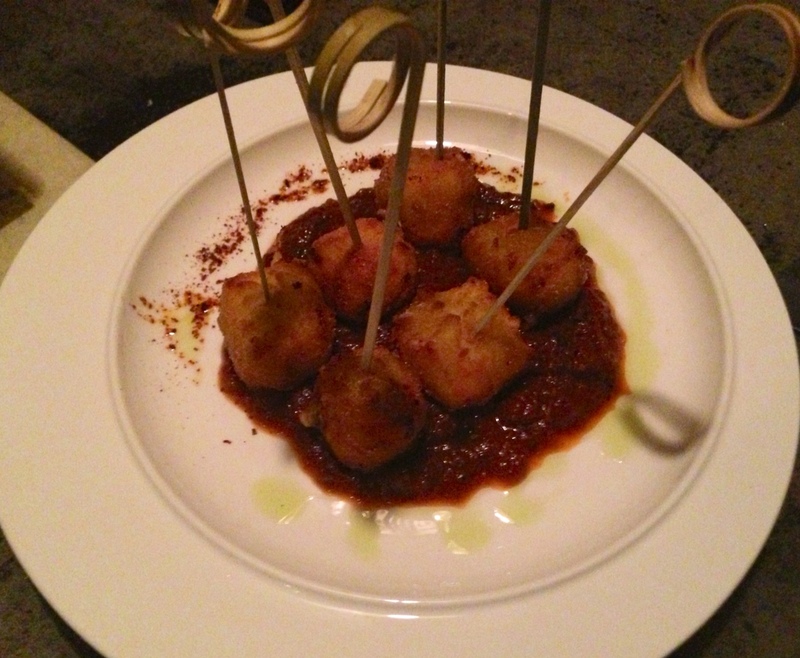 If you’re into Jalapeño Poppers, then you will love Fonda Lola’s take on it: the Panela Popper ($7). This jalapeño marinated Panela Cheese, which is then coated in corn meal is ooey-gooey good while still being light and crispy. Plus, the kick of the jalapeño is still there without being too overpowering. Now what would a Mexican restaurant be without tacos? 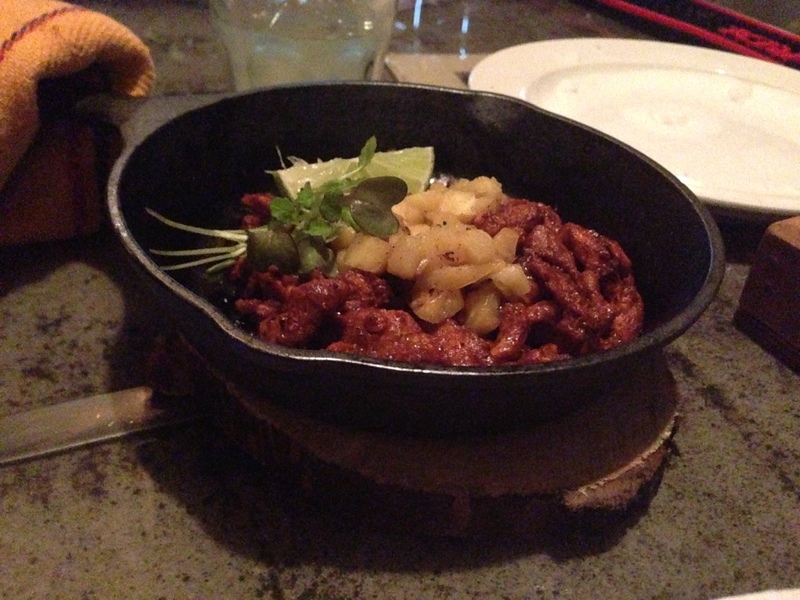 Tacos al Pastor ($10) are served in a hot skillet in three types: pork, beef and marinated tofu. This family style offering also comes with home-made tortillas, salsa and other fixings (including delicious pineapple). I had the chance to try out all three types of tacos and they were all seasoned well and better than tacos I even had while in Mexico, where I had just returned from. Open Tuesday to Saturday from 5 – 11 PM, the restaurant is small and is definitely going to become a hit on the Queen West strip amongst those who crave authentic Mexican. Thankfully, you can make reservations. Prepare yourself for the Fonda Lola experience! Originally posted to Ama’s twice-weekly column on Toronto Is Awesome. Let’s be honest: who here doesn’t love steak? I mean: if you’re a vegetarian, that makes sense. But if you’re a tried and true meat eater much like myself, then steak is like the holy trinity of meats. So when I had the opportunity to check out Chicago transplant chain, Morton’s Steakhouse (located in the Park Hyatt Hotel, found in Yorkville) – I was not only excited by the opportunity but a little nervous by all the meaty options. Let me tell you this much: Morton’s has you covered. Upon entry into the restaurant, you are greeted by the hostess who takes your jackets. She is friendly, warm and inviting. You’ll note the bustling bar behind the hostess and then to the right, the grand dining room and an upper level (with private rooms, which we accidentally got lost in, attempting to find the bathrooms). The main dining room is dimly light and romantic, with just enough light from the kitchen glowing out. The kitchen also is entirely open, so for your entire meal you can watch how things are prepared. The banquet style table has a pull-out table, for your comfort. This was a huge plus for me. Just for the after meal (ahem) food coma. Our server came to our table and was extraordinarily knowledgeable. Going through the entire menu, I was feeling a bit – overwhelmed with options. But she was great in letting us know some of the Morton’s Steakhouse classics while giving us a rundown of the daily specials. All throughout the entire dining experience, she felt us made comforted and made our dining experienced relaxed. We started off our meal with Ahi Tuna Tower and the Shrimp Alexander (which the server told us was a Morton’s classic dish). First of all, for a steakhouse – man, do they pull off an incredible seafood dish. The Ahi Tuna tartare dish loaded with guacamole was fresh and vibrant and literally lick the plate worthy. I think Yuli and I fought over who could have the last bite. Whereas, the Shrimp Alexander had the great flavours but could not compete with the Ahi Tuna Tower. I can see why it is one of the Morton’s classic dishes with its rich flavoring and juicy shrimp but I think we got spoiled with our first Ahi Tuna bites. As we were ordering mains and sides, our server recommended the Chicago Style Prime Bone-In Ribeye for myself, for its juicy and tender preparation. She told me that the bone would add in more flavour and the cooking would have more of a red centre. All of these things sounded like quality meat to me. Yuli tested out the Porterhouse Steak. For our side, she recommended we test out the Bacon & Onion Macaroni & Cheese as well as the Sweet Potato Casserole, part of their new fall/winter menu. As promised, each bite into my steak (Chicago Bone-In Ribeye) was juicy and tender – cooked just to perfection – weighing in at 24 oz of pure love. The bone clearly did add in an extra smokiness and flavour that couldn’t have been achieved otherwise. Our server also let us know that Morton’s uses USDA Prime beef, aged from 23 – 28 days, which I think may have added to the profile of the steaks. As for the sides: heaven, pure heaven. Because nothing says fall/winter like hearty macaroni & cheese (with bacon) and then sweet potato in a crunchy browned crust of cinnamon spiced pecans. I wanted to eat all of them for days. The perfect compliment to two well cooked steaks, if I do say so myself. Should you be feeling adventurous, Morton’s has an amazing selection of desserts (hot and cold), some of which are presented to you on a silver platter – super fancy! We went with the Raspberry Souffle, because you know: raspberries! If you’re in the mood to treat yourself or your loved one or you just love eating a fine piece of meat, then don’t walk… run to Morton’s Steakhouse. Trust me, I have been dreaming of several thing from that menu since we went and I have been having absolutely no regrets. 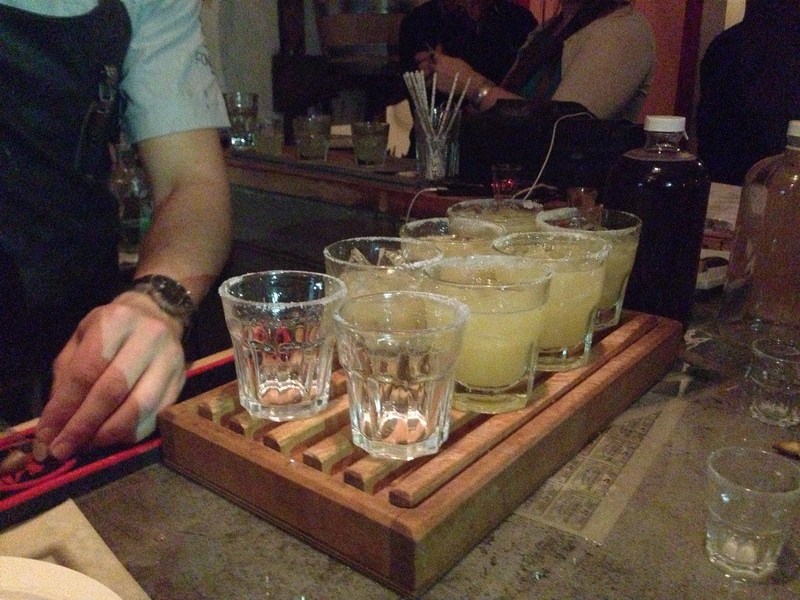 When one thinks gourmet, high-end food – one does not think: ping pong club. But Executive Chef Jon Lovett has taken to changing the minds of King West ad execs and ping pong lovers with his beautifully crafted and inventive table treats specifically with his new Fall/Winter offerings. With an in-house meat and breads program, one of the dishes that Jon prides himself on is the Charcuterie Plate ($12). All the meats are cured in-house for perfect smoke and great flavouring. Included was a delicious terrine, which made this just a bit fancier than your normal board and some classic crisps with preserves. Next up, we were treated to an array of beautiful and fresh Oysters (3 for $8, sourced from Rodney’s Oyster House) and served with a molecular gastronomy technique of hot sauce caviar pearls. This served as an extra little kick but also made for a stunningly gorgeous dish. I mean, how can you go wrong with freshly shucked oysters? Now this could only be a treat your grandmother would love but something that the adventurous and willing will try: beet-root flavoured deviled eggs (6 for $9) and let me tell you: they were probably one of my favourite items. But if that wasn’t up your alley (are you crazy) then these lightly battered in-house preserved pickles, deep-fried (of course) would be more your speed. $8/serving and with a wicked Ranch sauce, it was served up like one of the Blooming Onions you would have at the CNE in the Summer. Next up we had an impressive take on an old classic: the Chicken and Waffles Platter ($19), only this time we are delighted with a Stuffing Waffle and King Capon drumstick and yams. The chicken was incredible juicy and married well with all these holiday classic flavours, however I still think I prefer the OG Chicken and Waffles Platter. I’m a die-hard Spin Chicken and Waffles girl, what can I say? Chef Jon has always strived to make fun and unique food and this takes the cake. I have to say the next two dishes were two of my other favourites from the night: King Capon drumsticks (3 pieces for $12) and the Pretzels Bites with Cheese Sauce (9 pieces for $9). This chicken was off the chain. The sauce was rich and finger lickin’ good. Lots of Asian flavours and honestly, 3 pieces would not be enough for me. I’d want a bucket full! With the pretzel bites, it was squishy and the epic cheese sauce sold the dish. Just enough tang and the pretzel was not overly salty which was perfect. SPiN is a great place to let your hair down after a long day at work and take in some good eats, delicious cocktails (might I suggest the BFF or the Gin Blossom, $12.40 for 2oz. of alcohol love) and night to laugh at your pong mishaps. 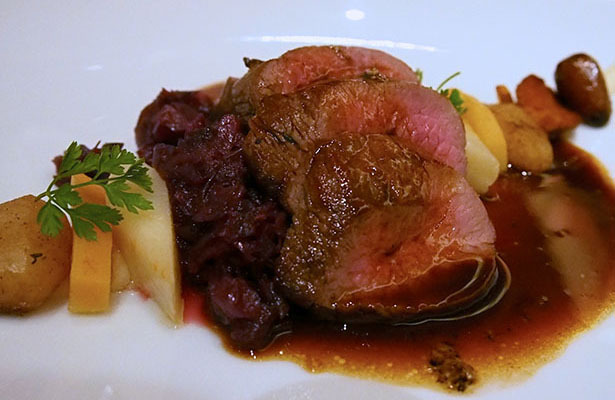 It is going to be a winter holiday that nobody forgets, as I was invited to the Ontario Pork and Zwilling Products food writer dinner at Ruby Watch Co. in Toronto to taste hearty winter pork classics prepared by by Chef Lora Kirk. The evening might just might be the most delicious mouthful I ever tasted, with everything including pork and using thought-out local produce and ingredients. As we entered through the doors, we were greeted with a lovely ice wine from Inniskillin. As we were ushered to our seats and given a quick history on wines, plated below us was a beautiful dish of of Willowgrove Bacon & Egg Salad. The simple elegance of this dish was balanced with the coffee-cured thick cut bacon and semi-poached hen egg. 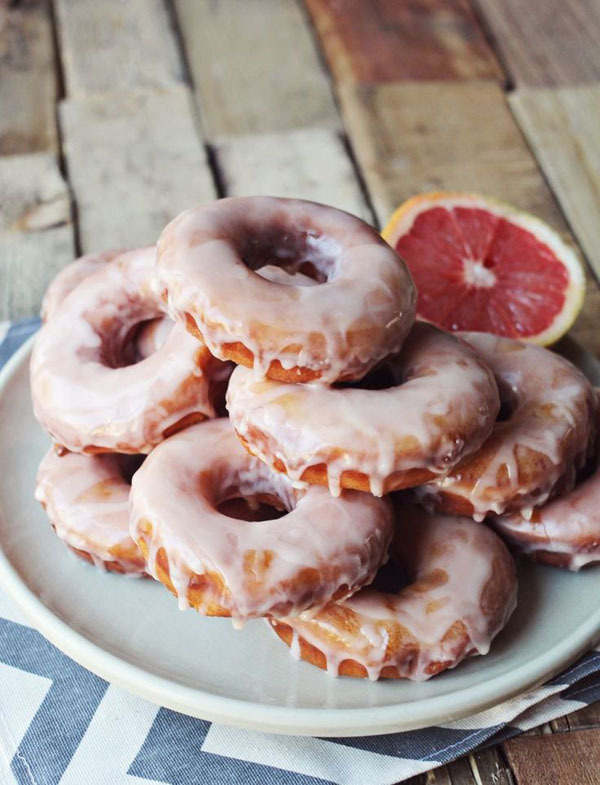 The perfect amount of salty, sweet and delicious. For our next dish, we were brought out the main-course served family-style on all Zwilling Products. Throughout our table, we passed back dishes of porchetta with peaches & mustard, butternut squash Mac & Cheese with Pork Fat Panko, Brussels Sprouts, Smoked Ham Hocks & Onion Petals, Confit Heirloom Carrots, Carrot Top Pesto & Crispy Pork Ears. Noone at my table had tried Pigs Ears before and it was a huge hit across the board. However, the biggest hit at the table had to have been the Mac & Cheese. Creamy and delicious, I found myself going back for seconds and thirds. 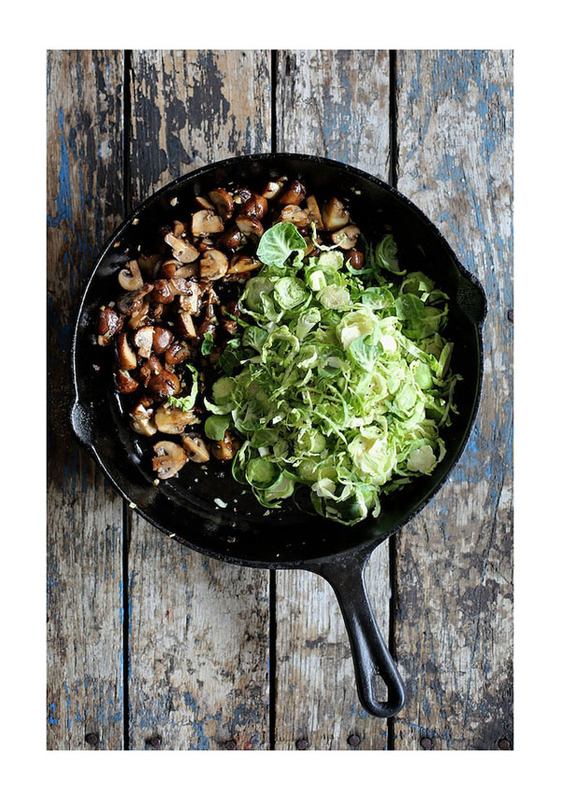 My second favourite dish was the brussel sprout, as it was giving me all the fall love that I want and needed. Next up, I never thought cheese and pork could be done together as a dessert but boy, was I wrong. Chef Lorna served up in classic Ruby Watcho style this 10-Year Old Cheddar Cheese with Pulled Pork, Beets and Date Relish. Huge chunks of this cheese married so well with the pork and would have been perfect with a mulled wine. But the final highlight of the evening was the Maple Bacon Ice Cream with a fudge brownie and huge piece of bacon on top. If this didn’t turn you to the bacon side, then I don’t know what would have. If I could eat that everyday, I probably would have. Thankfully thanks to Chef Lorna Kirk, Zwilling Products and Ontario Pork — I have some wonderful Christmas recipes in mind. You can check out these recipes (and more) here. Every Friday we bring you our favourite foodie sights and sounds. 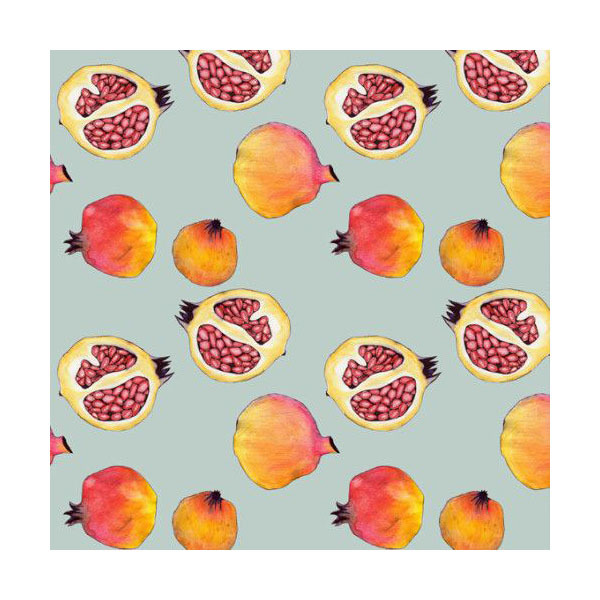 Everything from food packaging and food inspired art, to recipes and reviews. As ever, really wishing I wasn’t in a rental so I could tare some things apart and set something similar to this us. Love the line work from Spanish artist Marina Moralres. I really can’t ask for more in a breakfast food. It’s compact and portable. I know, I know, another donut right after another. But, it’s GRAPEFRUIT! I bet this tastes as good as it looks! Just last week, hundreds gathered into the Beer Academy for five hours of all-you-can-eat poutine mayhem dished up by events company Joylister. It was Toronto’s first Poutine Festival and it brought out the curd lover in all. Five restaurants took place in the first Poutine Festival showcasing all that they had in the fries, curds and gravy combos. Some kept it simple but some went over the top and fabulous. The event was $35 and sold out within 2-minutes of tickets going on sale. For those lucky enough to get in, indulge they did! As we navigated our way through the Beer Academy and made our “Poutine Routine”, we went into the basement to check out Great Burger Kitchen’s Butter Chicken Poutine. This was the one I was simply dying to check out, as I have a thing for rich Indian flavours and disappointed I was not. The sauce was light and creamy and the chicken was juicy & tender. I have always been afraid to try variations of butter chicken anything for fear of the butter chicken sauce being too heavy. But for this portion size, Great Burger Kitchen knocked it out of the park. Next up, we saddled up to Coquine Restaurant and their Duck Confit Poutine. Perfectly cooked pieces of duck with perfectly salted fries and brie cheese and gravy. It was like a flavour explosion in my mouth of perfection. All the salty flavours married perfectly together and didn’t overpower. You felt as if you were eating a 5-star French poutine. As we made our way upstairs, we noticed that crowds had swelled and it was time for a plan of action. We divided and conquered the lines so first up, we took on Lou Dawg’s BBQ, The Mighty Loutini. This poutine consisted of none-other than pulled pork, which had heaps of it on top. I have had the original Mighty Loutini at Lou Dawg’s but this mini-version did not translate very well. The fries didn’t seem cooked very well and the pulled pork while it was delicious, wasn’t the standard I expect from Lou Dawg’s. The poutine was good but not GREAT. For those who attended Poutine Fest, I would highly recommend going to Lou Dawg’s and having the Mighty Loutini there. Next up was the infamous Queen West eatery Poutini’s House of Poutine who was serving up two types of poutine: Traditional and The Works. Since we didn’t come to a Poutine Festival to check out Traditional Poutine, we went with the Works and man, was it good. Topped with huge bacon pieces, sour cream, chives, fries and gravy — it was like eating a big old baked potato. It also kind of reminded me of Lick’s Taters and Cream, only with some gravy. Either way, I was super into it. After we ate (and drank) our way through the poutine selections, we decided to cast our votes for (as Joylister called it), 2013 Poutine King Champion. Both Yuli and I were split on the vote. She casted a ballot for Coquine Restaurant and their Duck Confit poutine and I was torn between Great Burger Kitchen’s Butter Chicken Poutine and Coquine Restaurant’s offering. At the end of the night, after all was said and done, Joylister tallied the votes and Coquine Restaurant won out amongst the restaurants for 2013 Poutine King Champion. Joylister has gone on record as stating they will be setting up more food events in the future. Stay tuned to their website. 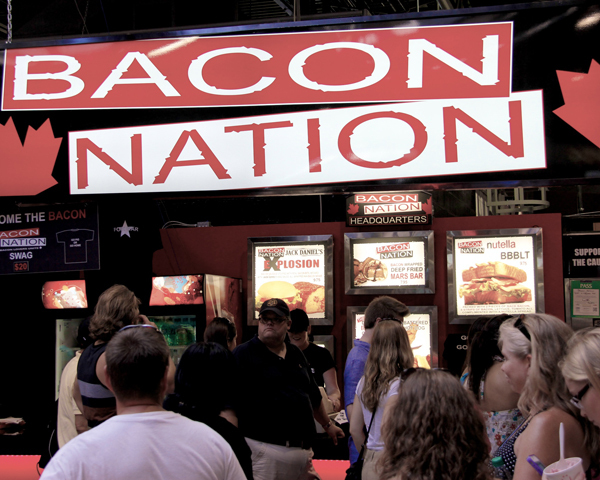 If your passion for all things deep-fried and/or bacon runs deep, then you best march yourself over to the CNE. The Canadian National Exhibition (CNE) kicked off on Friday, Aug. 16 and runs until Monday September 2 in downtown Toronto. As the years have gone by, the focus has become less about the midway, and more about the crazy & outrageous food offerings to be found inside the iconic Food Building. Each year, food vendor offerings have grown larger in size and more ridiculous in nature. Bacon Nation is kicking it up a notch again with the “Crazy Canuck Burger” — two ground bacon patties topped with a slice of peameal bacon, applewood smoked bacon, cheddar cheese, bacon mayo and more bacon bits. Plus a tomato slice and lettuce leaf to, you know, keep it healthy. The taste is phenomenal however if that isn’t enough bacon for you, you could always up-size your combo to “The Notorious P.I.G” (which takes you to a whopping 7,500 calories) and gives you an order of bacon-cheese fries and a peanut butter and bacon milkshake. Next up, we’re met by Le Dolci, the bakery on Dundas West who have taken on the Cronut, which they are called the DoCro. 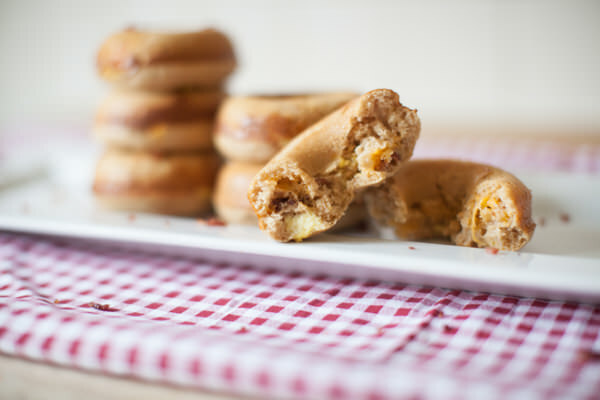 They have teamed up with CNE concession Epic Burgers and Waffles, who in 2011’s served up the infamous Krispy Kreme burger. Well folks, introducing: the Cronut Cheeseburger. A cheese swiped beef patty slapped between a DoCro, saddled with cinnamon sugar and generously topped with homemade maple bacon jam. Least we forget the other trend this year: NUTELLA! New CNE concession stand, Spread has decided to take this chocolate-hazelnut spread and drizzle it all over sweet potato fries. But that is just one dish that is truly epic. The next one (which was incredible) had Just Cone It (another CNE concession stand) introduce their Spice Cream Cone. This warm pizza cone is filled to the brim with Nutella then vanilla soft serve. The cone is then accented by some chili flakes and crispy bacon bits on top. Because: NUTELLA AND BACON! But that isn’t where the Nutella fun stops, oh no. If you want a lighter dessert than the Spice Cream Cone, check out the Hazelnut Gelato Panini ($8) from Gourmet Grill. This dense hazelnut cream is packed into a warm brioche bun and tasted like heaven upon first bite. But wait: not everything in the building is fattening and crazy. I tried out the Nacho-Rama from Wild Child’s Kitchen who is serving up vegan realness. All corn tortillas, savoury guacamole, fresh salsa, cashew cream and faux meat. A large serving is a whopping $8. Also: Corrado’s was serving up a vegetarian and meat-stuffed rice balls topped with marinara sauce. Or finally Thyme and Olives brought out the Eastern flavours by presenting Spinach and feta stuffed pies. 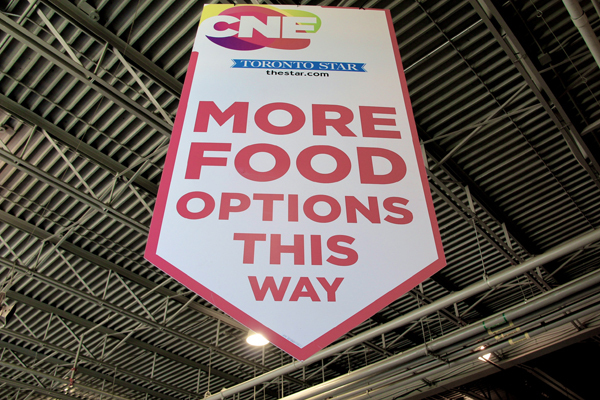 So prepare not only your wallets but your waistlines this year at the CNE, it has shaped up to be a tasty experience. The end of summer in Toronto is always marked by one thing: the CNE. As the years have gone by, the focus has become less about the midway, and more about the crazy & outrageous food offerings to be found inside the iconic Food Building. Each year, food vendor offerings have grown larger in size and more ridiculous in nature. So as if the hazelnut spread wasn’t just good on its own, new vendor Spread is taking everyone’s favourite to the next level. Let’s just say, Nutella Fries and Nutella Spring Rolls. I wonder if you could ask them to make Nutella Poutine? Is it a Burger? Is it a Croissant-Donut? Oh, it’s both! You thought the burger on a Krispy Kreme bun was badass? Well, it gets so much better. Introducing Epic Burger’s cheeseburger placed in-between Le Dolci bakery’s take on the Cronut, which they are calling the Do-Cro. You’ll either end up in gastro-heaven or hell with this one. 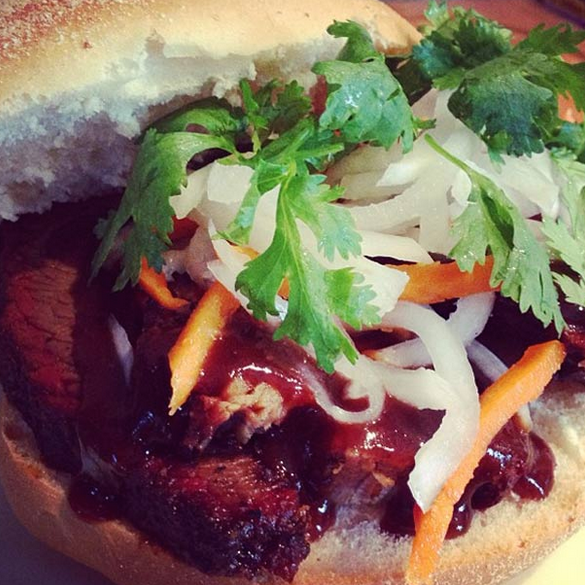 If bacon isn’t your thing, then make your way over to PULL’D for all barbecued and pulled pork. Last year, they served up red velvet pancakes stacked and layered with pulled pork. This year: the possibilities are limitless, and they’ve got some surprises ups their sleeves. New addition, Philthy Phil Philadelphia, is generating buzz, and serves authentic Philly cheese steaks with great potential. Can they live up to the hype? Which newest food offering are you excited by this year?